Thursday's decline captured the target of 20 SPX points from the bearish sell trigger outlined on Wednesday (1403 to 1383). In fact, all the bearish sell triggers I've outlined since the 1474 print high have now been captured. The failure of support at 1403 caused significant technical damage to the market, but in this update we're going to examine both the remaining bullish potential and bearish potentials in detail. 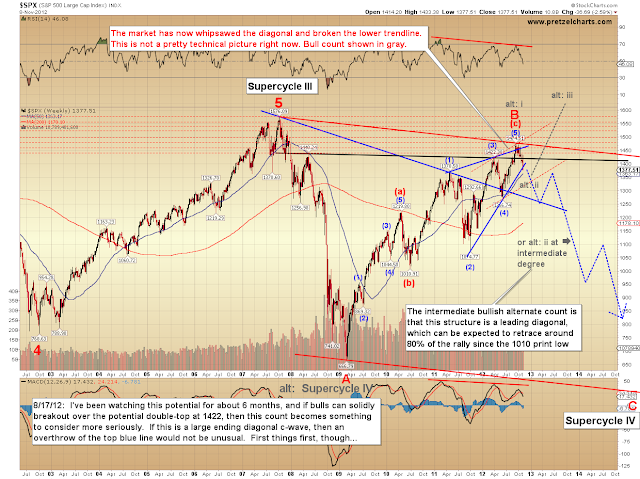 The market has reached another inflection point, and further downside from here could spell long-term disaster for bulls. The odds that the market has seen a major trend change at the 1474 high are increasing daily, and the chart below shows why this zone is important. 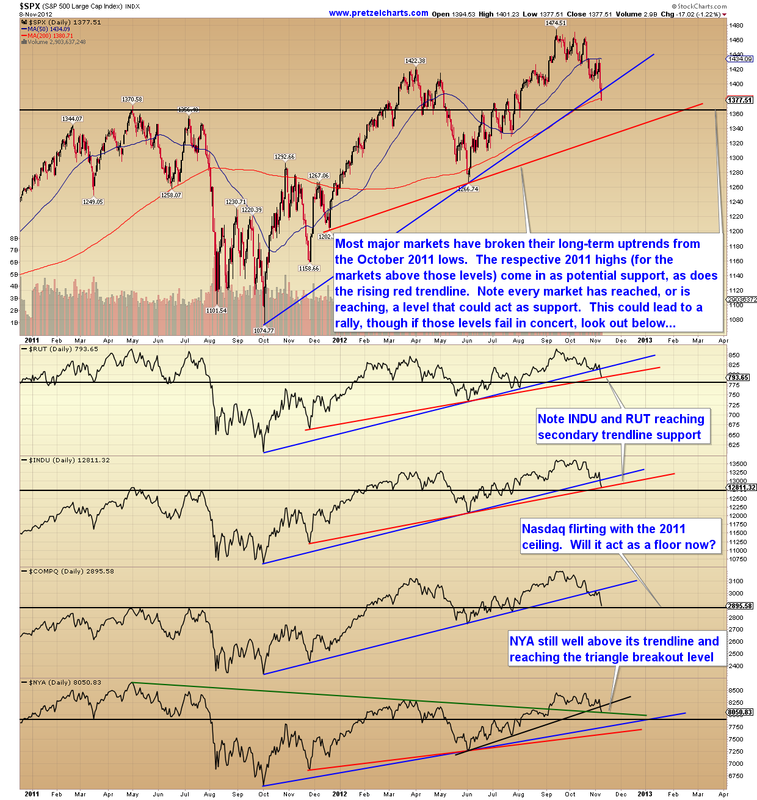 Most major markets have broken the long-term uptrends from the October 2011 lows, but are now reaching possible support levels concurrently. As promised yesterday, here is the intermediate bullish interpretation that remains standing, shown on the S&P 500 (SPX) chart below. This would make for one heckuva surprise from bulls here. While this count is still completely viable, I continue to have no intention of front-running this decline except at low-risk, tight stop entries, since the trend is clearly down at the moment (I trade primarily futures, so am rarely subject to huge gaps down as cash traders can be). Front-running is only for the very nimble now, because of the danger of the bear count (shown later) which suggests a nested third wave decline -- which means it can go days without coming up for air. If SPX can generate an impulsive (five wave) bounce, we can run with this count as a more significant and "safer" potential play. 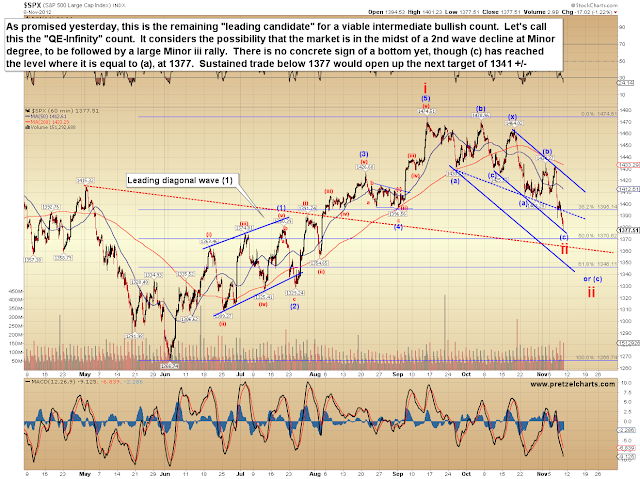 Above 1434, and we can start favoring this count. 1. The QE-Infinity liquidity injections, which start on November 14. 2. 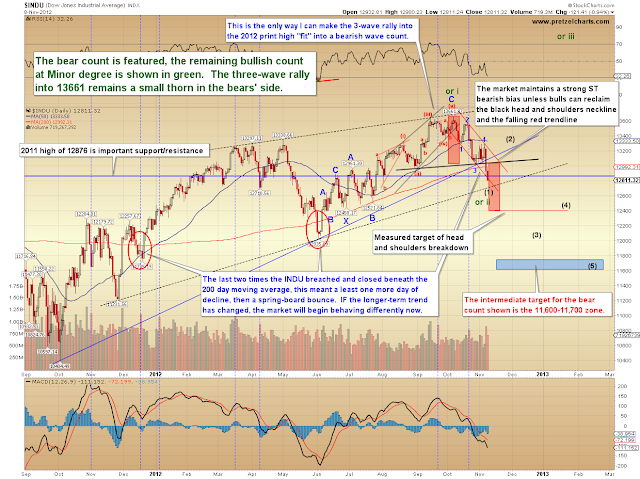 The three-wave rally into the 2012 print high on the Dow Jones Industrials (shown later). 3. 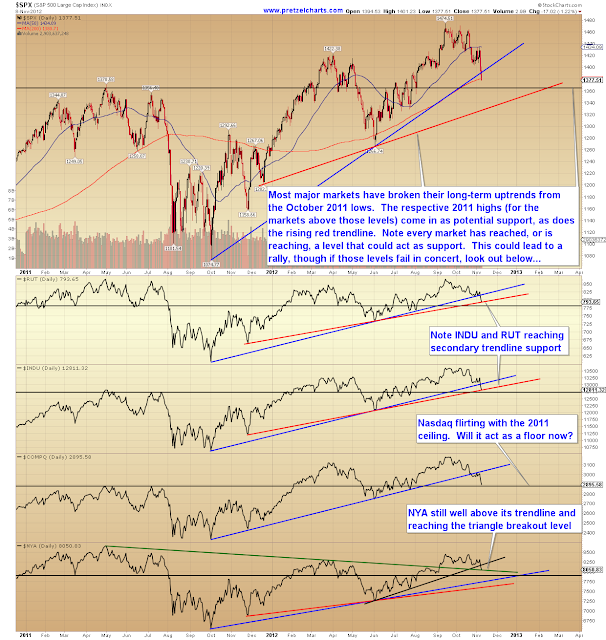 Big money sentiment is quite bearish. This is often bullish. 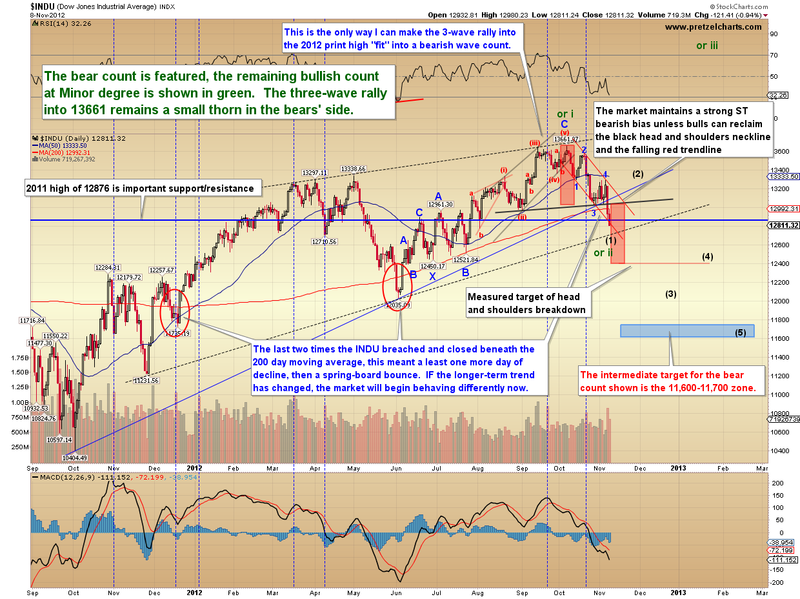 The Dow Jones Industrials (INDU) presents a slightly different option, due to the possibility of a complete five-wave decline. The bull count is shown in rough detail in green. 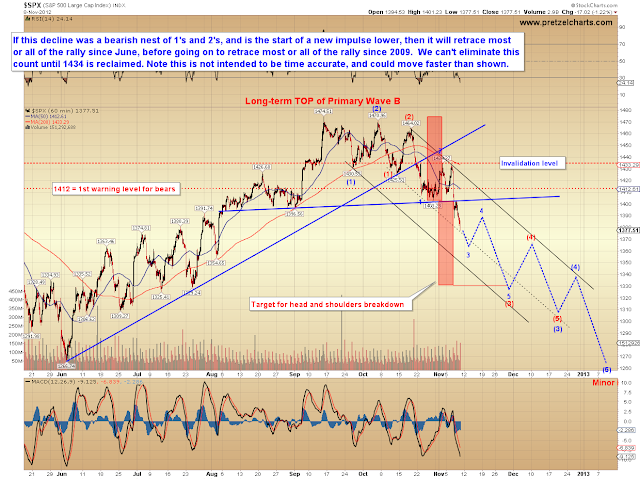 On the long term chart, here's how the options break down right now. The bear count is featured on this chart, but still has work to do to prove itself. Two bullish alternate counts are noted -- the first is at Minor degree, as discussed a couple charts ago. 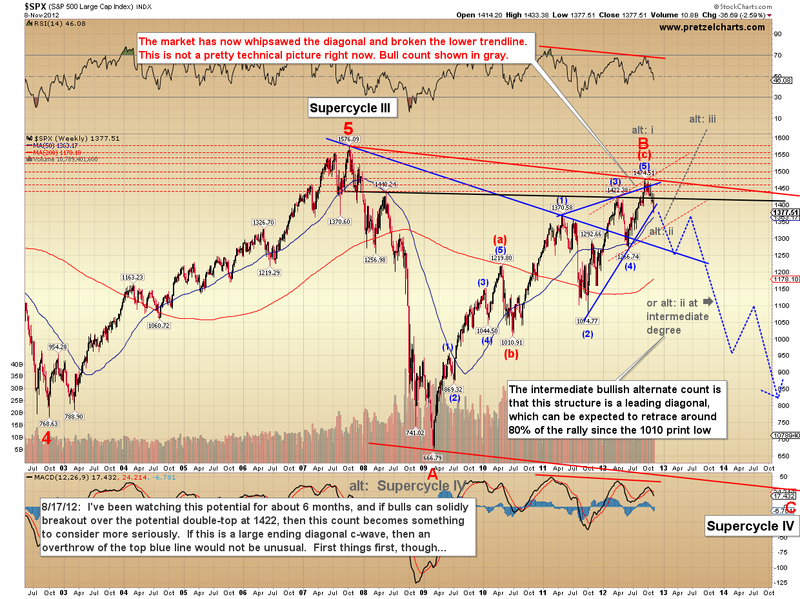 The second bullish alternate is at intermediate degree, and would still be quite bearish well into 2013. In conclusion, the market is approaching a potential inflection point, and bulls need to capitalize on this to keep playing. If bears can push through here, there will be little left for the bulls to cling to, and bears will get one step closer to claiming the market for the long-term. Trade safe. Very important was your note that SP500 has whipsawed the diagonal which connects 1370 with 1422. 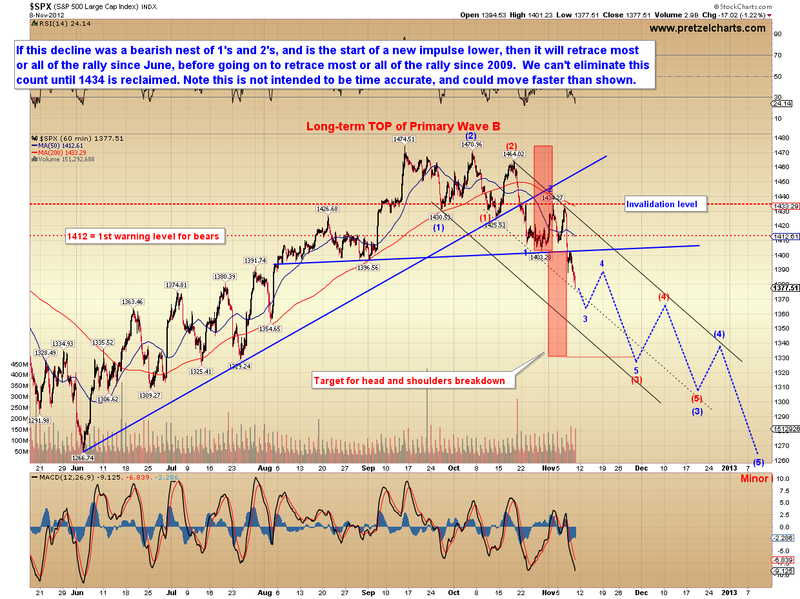 This detail could be decisive in the recent broken trendline. I didn't find on the net such complex analyses of the market as you do: waves, trendlines, oscillators, Fibonacci, seasonality, but also fundamentals and, above all, investor psychology, crowd sentiment, where your observations are absolutely remarkable. When I was participating in chess championships, I used a similar approach, combining the strategical ideas and principles with very concrete tactical calculations in order to find the best move. Indeed, only by taking into account all of these elements - waves, trendlines, moving averages, seasonality, sentiment and fundamentals, you can correctly evaluate the situation and anticipate the most probable outcome. copper does not confirm the rally since early 2011 (4.5 in feb 2011 with SP around 1340, but only 3.9 - 4 in early 2012 with SP 1422 and 3.83 in sept 2012 when SP hit 1474), silver does not confirm (50 in early 2011, 32-35 this autumn), the ratio gold/silver increased from around 36 (1800/50) to more than 53 (1730/32) - a bad sign, and the other commodities also do not confirm the rally since last year. China does not confirm: while Wall Street flirts with new all time highs (Dow lacked only 506 points last month to establish a new record), Shanghai index hovers around the bottom of the last 5 years. Some (too many) say China is bottoming. It's possible, but if the decline 6000 - 1700 was wave A, after the rally 1700 - 3400 (around 38% of the decline, an ideal B wave) could follow a wave C to bring Shanghai Index (well) under 1700. Japan is nowhere, with the Nikkei at 22% of its 1989 high, Italy is nowhere, with its indice at around 15000 (it was 44000 in 2007), the same is true with Spain, France etc. The way Apple has fallen since September it's frightening (24%, but see also how steep, how impulsive is the drop: no overlapping, no hesitations), perhaps now Apple will form the right shoulder towards 630, since 530 seems to be the neckline, but then...). Seasonality: last 3 winters bears were literally burned alive by the relentless rallies: they bet against SP 1020 in nov 2009 and brought it by their short covering to 1219 in late April; they bet against SP 1040 in September 2010 and brought it to 1370 in May next year; and they finally bet against SP 1074 in October 4, 2011, bringing it to 1422 in early April. The bears learned their lesson in these 3 consecutive winters: no more shorting in winter! But without short covering it won't be rally. So, this winter could be different. Especially if we remember that this summer was already different: first summer without pullback (a small, 156 points pullback was finished on June 4: too small - 210 points in 2010, 296 points in 2011; after such a small pullback, I think the 208 points rally (1266-1474) is all of the rally. Moreover, the 808 points (666 - 1474) of the whole rally seems too much. The 42/43 months of the whole rally seems also too much (I admit, the rally October 2002 - October 2007 had 60 months, but after a decline of 30.5 months [March 2000 - October 2002], while the decline 2007 - 2009 had only 17 months: 42/17>60/30.5). By the way, 1553 - 769 = 784 points of decline, 1576 - 769 = 807 points of rally, 1576 - 666 =910 points of fall. Let's summarize: 784 - 807 - 910 - 808 - these are the lengths of the the last 4 legs since March 2000. These 808 points could fit perfectly with a complete leg! 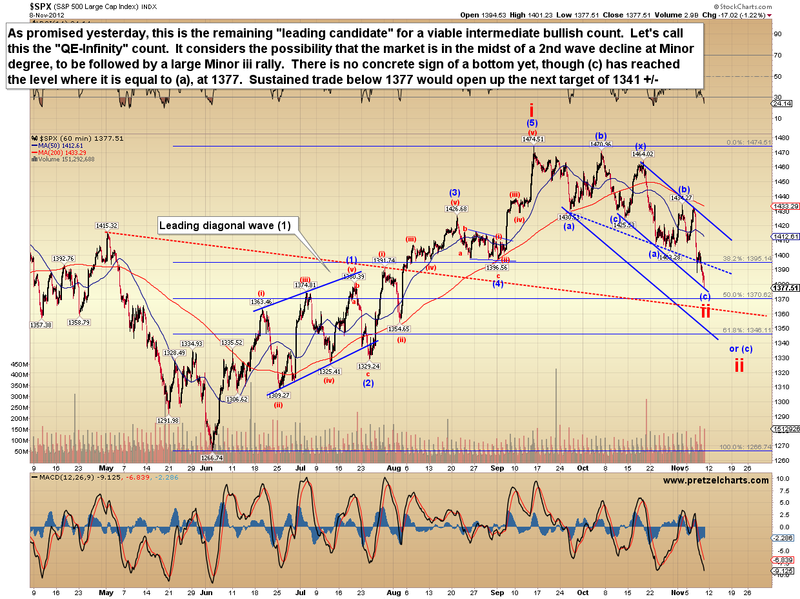 1474 could be the long-term top. I apologize for writing so much. Please tell me what do you think about all these ?